The Enterprise houses an interspecies auction for the rights to a supposedly stable wormhole. Meanwhile, Troi falls for one of the bidding delegates. The Barzan woman has a breathing apparatus attached to her face. I like the set-up of the Benzites (Mordock and Medon) much better. I love how the Ferengi are obsessed with getting chairs as soon as they arrive. Not the subtlest of metaphors, but a fun one nonetheless. When Troi, intrigued, looks up information about Ral, it's surprisingly modern behavior. Nowadays, we use Google. When Mendoza brings up the poker parallel, it makes this episode seem eerily similar to Casino Royale, what with all the posturing and the poisoning and the intrigue and whatnot. When Ral speaks as a delegate, he sounds exactly like a corporate speaker. I like the scene with Crusher and Troi in the exercize room. Good scene. The writers are trying to address the potential for Troi's abilities to be unethical. The distinction between what is appropriate and what is not needs to be made, and this episode succeeds in making it. The argument Troi and Ral have about it is provocative. I love the confrontation between Ral and Riker in Ten Forward. There's some excellent dialogue throughout this episode. This is an episode I think I enjoyed more in the rewatch. There isn't much in the way of action or crazy sci-fi, but there are a lot of good character moments, especially for Troi and Riker. The romance between Troi and Ral is ridiculously rushed, but that's just an inevitable side effect of episodic storytelling. However, the writers are earnestly exploring some subtle ideas that could only really be explored in a speculative setting, so I give it a lot of respect. This season feels much more mature than the previous ones, and it can even be seen in a "bottle show" like this one. Again, I thought gold was worthless in the 24th Century, although I suppose that could be gold-pressed latinum the Ferengi are bargaining with. The two Ferengi who get left on the other side of the wormhole, Arridor and Kol, are eventually seen again in VOY's "False Profits." 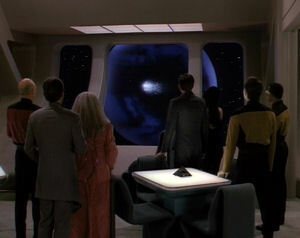 With both the idea of a stable wormhole and the first appearance of the Delta Quadrant, this episode could be seen as a precursor to both DS9 and VOY.